The market has different buyers with varying risk appetites. The mega farmers base their purchase of agricultural land on the ever so popular “ROI” return on investment on the capital layout. This investment approach tends to be considerably lower than, than what the general buyers’ market demands. Items found to be included in the purchase price are the take-over of existing operational debt, movable items, stock on hand and more. The other issue of concern is transferable water-rights, the valuer is to establish proof on the availability of the registered water capacity per land portion. When evaluating an operational farm, the plantings, and the future demand for such should not be uncertain. Last but not lease operational improvements such as cold storage, packaging, and cooling facilities which form a rather integral part of the operations can represent 20%-35% of the purchase price. I believe agricultural valuations require a vast amount of research and that the face-value of information available in the general public domain can be misleading. Although the Profits Valuation Method is considered second to the Comparable Sales valuation methodology, it offers a selective insight into the cost-effectiveness of the operational activities. A good farm being poorly managed versus an average farm being well managed determines the potential and future growth of such agricultural business. So, then a comprehensive valuation report should include the various land use values (plantings and water rights), building improvements and business analysis, based on the Income and Expense Statements. A lease is “the right to use” an asset rented for a period for predetermined production etc. Specialised maintenance is more economical as per lease contract! 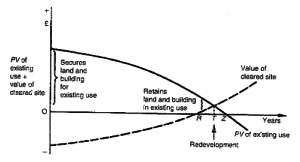 Redevelopment of Property: One property or an entire suburb! As can be seen from the above graph is that with the acquisition, the use of the building for income generation takes priority. The land presents a secondary value apportionment. Let us assume that the economical lifespan of the building is 25 years, which is presented by the figure Z. The aim of this article is to highlight the difference between two major approaches to determining the insurance value for buildings. The reason why it is important to understand the difference is due to the direct consequences it has on the accuracy of the final insurance value that in turn affects and determines the monthly insurance premium you will be paying and the possibility of exposure to average, as applied by insurers in the case of a claim. This article provides a brief account of some definitions and terminology used in the property industry. The aim is to highlight the distinction between the terms movable and immovable assets (also referred to as property). As you probably know, modern day real estate economies are cyclical and goes through cycles of suppressed market conditions, where property prices are relatively low, to expansionary conditions of unsustainable high levels. Holding an investment through an economic cycle and buying or selling at the appropriate time is the aim of most investors. However, apart from the general real estate economic cycles, there is also the property investment cycle or building life cycle. The two are not exactly the same but they are very close.